Anyone who reads Lidblog or listens to this program knows that the key “must-go” annual event every year is CPAC, the Conservative Political Action Conference. Along with his other communication responsibilities at the ACU, Ian Walters puts together and runs the incredible CPAC program. AND, Ian is an accomplished singer/musician who performs throughout the Washington DC Area. Ian and I had a great discussion about conservatism, how to rate incumbents, the anger in today’s politics, the problems with MSNBC, my favorite event of the year, CPAC, and much, much more. And by the way, you can (and should) follow The ACU on Twitter @ACUconservative & @CPAC on Facebook facebook.com/ACUConservative and facebook.com/CPACNews. And watch their latest videos on YouTube by clicking here. And be sure to mark your calendar for Feb. 27-March 2 to join me at this year’s CPAC. Now click on the player below and enjoy what turned out to be a great show. 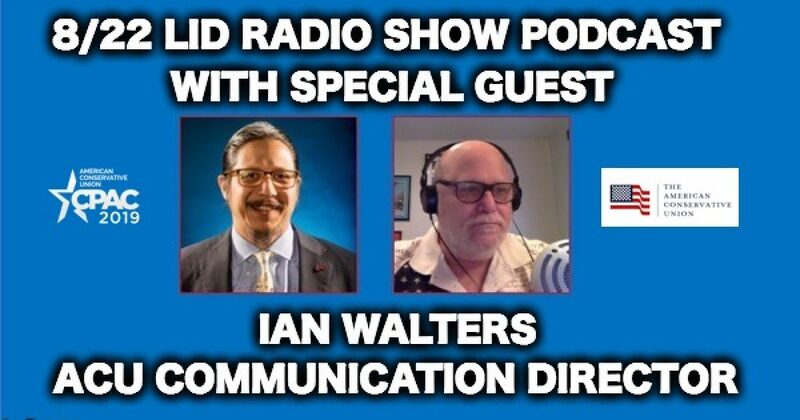 Listen to “8-22 Show With Guest Ian Walters ACU Communication Director” on Spreaker.